Alfred Perrott-White, who was British and later became an American citizen, was my first target shooting coach. We called him PW. He was tough as nails, yet sweet as can be. Circa 1898 – Born in Delhi, India, son of a British Army officer. 1910-1914 – Ran away at age 12 and ended up as second mate on a four-master after two around the world voyages. 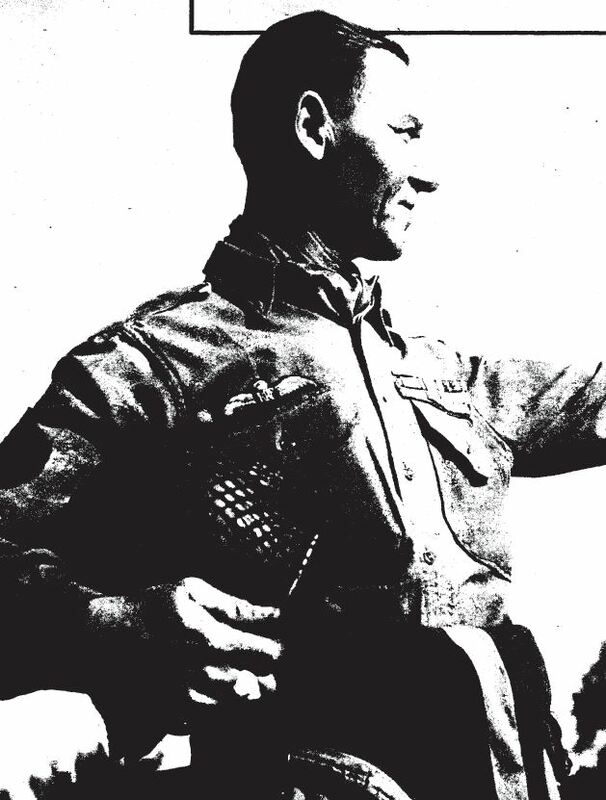 1914-1919 – WWI British aviator, awarded French Croix de Guerre. Bomber navigator for a short time, then 1915-1918 was a fighter pilot as a flight lieutenant (captain equivalent) as a teenager for 3 years (life expectancy 6 months). His father and two older brothers were killed in this war. Often dueled with the Richthofen Flying Circus. He was shot down, managed a forced landing in the infamous No Man’s Land and, and was stuck there for 5 days before being rescued during a British counterattack. Went right back to flying. Credited with three kills. 1920s – Served as an NCO in the 19th Hussars (British Army) in India and the Middle East. Fought the Insurgents at the Khyber Pass and other major battles. Discharged due to health. Doctors in England sent him to the US for for a climate change to aid his recovery. Spent two years traveling around the US, with visits to Mexico and Panama. Returned to England. 1938-1945 – WWII French Foreign Legion 1938-1943 as a sergeant, awarded Croix de Guerre two more times (silver stars), and US Army 1943-1945 as a T-4 or T-5. His remaining four brothers were all killed in this war. Originally serving in Africa, he was transferred to Europe. He commanded a machine gun squad covering the rear of the Dunkirk evacuation, was wounded in the neck and he kept fighting as his four men were killed. Was wounded again and was captured by the Germans. Weeks later, he showed up in Allied territory at Lyon, having escaped the moving prisoner train – quite a story itself – and made his way back on foot at night while hiding each day. He went back to fighting and served in Africa again. With his enlistment in the Legion completed in 1943, joined the US Army. He participated in the invasion of Italy, and then transferred into the heart of Europe on D-plus-five. By then, he was in his mid-forties, so his experience, knowledge, and language skills (6 languages) became quite useful to the US Army. Can you imagine today a US Army E4 or E5 in his mid-forties with RAF flight officer’s wings, three Croix de Guerre, 20+ campaign ribbons, a bunch of other French, British, and US ribbons and awards, speaks 6 strategic languages, and who has frequent visits from Colonels to discuss old times and current tactics? That was PW in real life. Later in life he served as city manager and other administrative local government posts in Ohio and for a short time in Arizona. He frequently competed at Camp Perry in the NRA national championships smallbore rifle phases. Someday I hope to be able to write more extensively about these and many other things he did. In the meantime, you may wish to go look up the “T-5 Colonel” article in the December 8, 1944 Yank magazine (pp. 8-9), and find a copy of “French Legionnaire” his book about his 5 year stint there. How sweet was he? He was the consummate gentleman. He was soft-spoken and kind to all of us athletes. He was funny and eccentric. He was warm-hearted. He taught us how to think – and not think – about the game, not just learn the technique. He loaned me a complete set of gear for smallbore so I could participate. It included a beautiful Anschutz Match 54 (state of the art at the time and still the equal of today’s rifles), along with a nice spotting scope and all the other gear. My classmate and best friend Joe Uecker and my dear sweet friend Sue Craig and I all shot together on his club team. Sue and I went to see PW when he got sick in the spring of 1974 just before his death. I met PW in 1970 and we spent a lot of time together until his death four short years later. Bill Krilling reminded me a lot of PW. He also was tough and sweet. I wrote about Bill this past Memorial Day when I blogged about him, since he had recently passed away, and about one of my first students cousin Neal M. Shank, who as a young man made the ultimate sacrifice in Iraq in 2007. I encourage you to read both those blog posts. They, too, were remarkable men. PW has been gone 40 years now, and I still think about him frequently. I will always miss you PW. Thank you for everything.